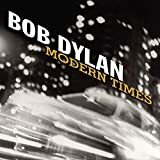 Bob Dylan's Modern Times is the 800 pound gorilla among this week's music releases, and is the one disc on my shopping list for tomorrow. I can fully recommend the new M. Ward album, Post-War, as well as Thea Gilmore's Harpo's Ghosts. If you are a Who fan, there are a slew of Pete Townshend remasters, and Daniel Johnston fans can grab two remasters, Continued Story/Hi How Are You (remastered) and Yip/Jump Music (remastered). The third season of Arrested Development and The Charles Bukowski Tapes were my DVD preorders.